What are stored procedure status variables? Whenever, you execute a stored procedure, it returns an integer status variable. Usually, zero indicates success, and non-zero indicates failure. To see this yourself, execute any stored procedure from the object explorer, in sql server management studio. 2. If the procedure, expects parameters, provide the values and click OK. So, from this we understood that, when a stored procedure is executed, it returns an integer status variable. With this in mind, let's understand the difference between output parameters and RETURN values. We will use the Employees table below for this purpose. The following procedure returns total number of employees in the Employees table, using output parameter - @TotalCount. So, we are able to achieve what we want, using output parameters as well as return values. Now, let's look at example, where return status variables cannot be used, but Output parameters can be used. 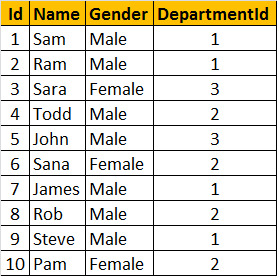 In this SP, we are retrieving the Name of the employee, based on their Id, using the output parameter @Name. Now let's try to achieve the same thing, using return status variables. Executing spGetNameById2 returns an error stating 'Conversion failed when converting the nvarchar value 'Sam' to data type int.'. The return status variable is an integer, and hence, when we select Name of an employee and try to return that we get a converion error. So, using return values, we can only return integers, and that too, only one integer. It is not possible, to return more than one value using return values, where as output parameters, can return any datatype and an sp can have more than one output parameters. I always prefer, using output parameters, over RETURN values. In general, RETURN values are used to indicate success or failure of stored procedure, especially when we are dealing with nested stored procedures.Return a value of 0, indicates success, and any nonzero value indicates failure. Store procedure name is wrong here.It should show "spGetTotalCountOfEmployees1" instead of "spGetTotalCountOfEmployees"
what you are trying to ask i am not under sand...!as per my analysis you create a procedure with "spGetTotalCountOfEmployees1" this name.if you want Rename the procedure "sp_rename "
spGetTotalCountOfEmployees1 is a stored procedure name used to demonstrate the usage of Output variable..
spGetTotalCountOfEmployees2 is a stored procedure name used to demonstrate the usage of Return value .. He said there is a typo in the description... it should be "spGetTotalCountOfEmployees1" instead of "spGetTotalCountOfEmployees" in the execution! Venket you are doing a great job, may God bless you. One question: - "Whenever, you execute a stored procedure, it returns an integer status variable. Usually, zero indicates success, and non-zero indicates failure. " Why doesn't this mean that execution is failed? Here the status is not 3 .. the count of employees is 3.. but the status is 0.. I have question...When exactly do we use stored procedures with output parameters and when do we use stored procedures without parameters? Both procedures return the same result, in same form, so what's the difference?